Progress in research is – to a large extent – driven by technological and analytical advancements. This is particularly true for the field of lipid research in the biomedical field, which was hampered for decades by the limited availability of analytical tools to address the enormous complexity of lipids in the human body. Now we are entering the era of “lipidomics”, which aims at addressing the entire complement of lipids in a biological sample, with wide ranging applications in basic research, biotechnology and biomedicine (for the state-of-the-art see also: Opinion articles on Lipidomics, ). Fat is bad! Is fat bad? For a long time, lipids have been considered as rather boring types of biomolecules, compared to, for instance, DNA or proteins. They are greasy and perhaps also smelly, and have gained quite some bad reputation in the public view as ‘fat is bad’ due to their link to disease or major discomfort – trans-fat, bad cholesterol, obesity and associated ailments. On the other hand, fats carry a lot of the flavor in our steaks or may have (commercially exploited) health benefits as nutritional supplements, such as omega-3 fatty acids. Indeed, lipids are a chemically extremely diverse class of molecules and range in abundance from perhaps a few molecules per cell to constituting a major component of body mass in specialized fat tissue. And they are indispensable metabolites in all cells of our body: specialized lipids make up biological membranes, which define the physiological cell boundaries or separate the interior of a cell into specialized compartments; lipids that are deposited as fat droplets (perhaps in some excess on the belly or around the hips) serve as most efficient chemical energy storage in the body – energy that goes into the synthesis of lipids may be retrieved on demand later on again as chemical energy or as heat, by their degradation; our heart beat is driven largely by energy derived from burning fat. And about 50% of the brain mass consists of lipid. That indeed should make us think about the importance of this class of biomolecules! Lipids are defined by their hydrophobic nature, which causes their “solubility in organic solvents” or “insolubility in water”, but these rather vague definitions already imply some of the technical challenges for lipid analysis. Numerous essential lipids are not readily extractable by organic solvents and some of the lipid intermediates may rather be quite soluble in water. Fig. 1 Lipids are highly diverse types of molecules (small selection): Arachidonic acid is a fatty acid and plays an important role as a signaling molecule; it is also a precursor for prostaglandins, which have hormone-like functions; TAG, triacylglycerol is commonly known as “fat”. It contains three fatty acid residues and is the most efficient storage form of metabolic energy. 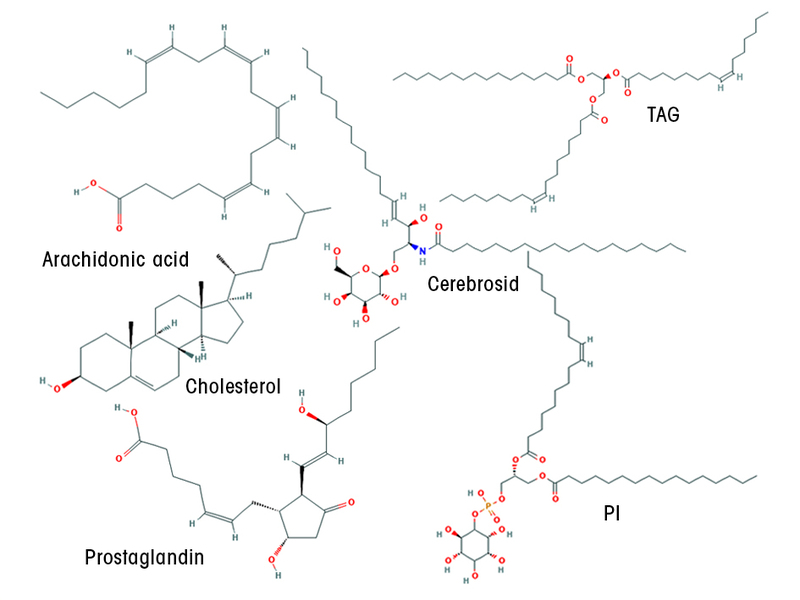 Dependent on the type of fatty acid (saturated or unsaturated), TAG is either liquid (olive oil) or solid (butter); PI, phosphatidylinositol is a membrane phospholipid; cholesterol modulates membrane proper-ties; cerebroside is a sugar-containing lipid in nerve and muscle cells (formulas obtained from the PubChem database https://pubchem.ncbi.nlm.nih.gov/). Figure 1 shows an assembly of diverse lipid molecules, including cholesterol, glycerolipids and sphingolipids, just to illustrate this chemical heterogeneity. Multiple lipid biosynthetic pathways are prominent targets of antibiotics (e.g. bacterial fatty acids synthesis) or pharmacological drugs (e.g. sterol biosynthesis in fungi or humans). A detailed classification scheme for lipids can be found at the LipidMAPS website (https://www.lipidmaps.org/) . A further major obstacle to the quantitative description of a cell’s or tissue’s lipidome is the extreme bandwidth of quantities for various lipid classes or species: functionally essential signaling molecules may be present only in minute amounts, and their analysis therefore obscured by bulk lipids that overshadow their detection. Their enormous complexity and lack of appropriate analytical technologies to address this complexity have been major limitations in lipid research. Until recently. In the last decade this has changed dramatically, with the advent of more broadly available mass spectrometric methods – outside specialized laboratories – that enable in-depth insight into tens of thousands of lipid molecular species that make up the lipidome: lipidomics is thus an emerging technology to comprehensively describe the entire lipid profile of a cell, tissue or organism. It represents a defined and rapidly proliferating branch to the “OMICS” revolution that aims at detecting and characterizing the entirety of genes (“genomics”), proteins (“proteomics”) or metabolites (“metabolomics”) in a biological sample, supporting the prospective development of “personalized medical treatment”. The technological developments in the lipidomics field were especially driven by the urgent need of a better understanding of the underlying molecular mechanisms causing lipid-associated disorders that have reached pandemic proportions, affecting hundreds of millions of people worldwide and that have put lipids and lipid research ahead into the spotlight of biomedical research. Obesity, diabetes type 2, coronary heart disease and atherosclerosis are well recognized as lipid-associated disorders, but also aging, cancer and neurodegenerative diseases may root in de-regulated lipid metabolism [3-5]. Several international consortia took the lead some 15 years ago to promote and coordinate lipidomics initiatives, such as LipidMAPS (https://www.lipidmaps.org/), Lipidomics Expertise Platform (http://www.lipidomics-expertise.de/), Singapore Lipidomics Incubator, SLING (https://sling.sg/), and Lipid-Bank (http://lipidbank.jp/). Following these ground-breaking initiatives, multiple metabolomics facilities and also commercial sites offering lipidomics services have emerged. 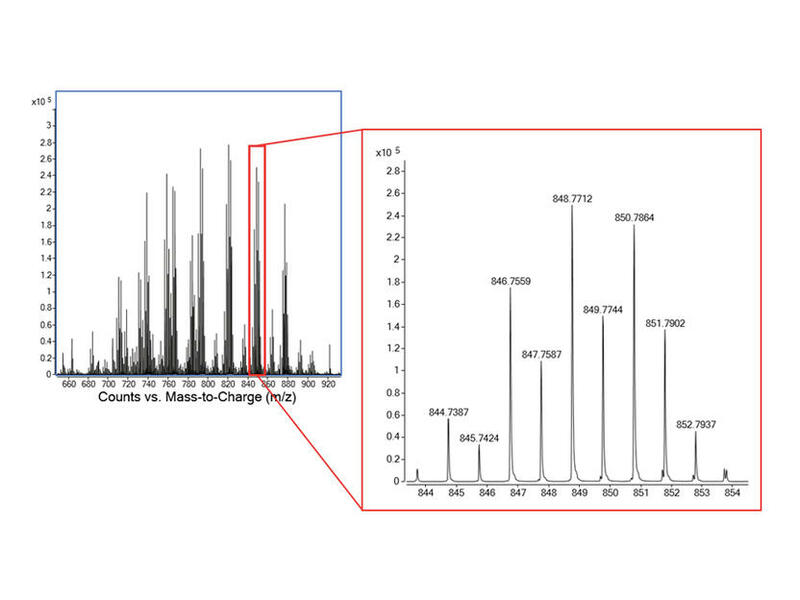 The most widely used method in lipidomics relies on mass spectrometry (MS) [6,7]: lipids extracted from a sample are injected into the vacuum of the MS, subjected to mild ionization typically in an electro-spray setup, and the ions separated based on their mass-to-charge ratio (m/z) before they hit the detector. This separation typically occurs in a series of specifically tuned alternating magnetic fields (“quadrupol”). In addition, ion traps may be used to select and enrich for specific ions prior to detection. To gain more insight into structural features, ions may be split in so-called collision cells into characteristic fragments. Time-of-flight (TOF) set-ups further improve identification of fragments based on their travel time in the mass spectrometer [6,7]. Image courtesy Dr. Thomas Eichmann (Institute of Molecular Biosciences and BioTechMed-Graz). Fig. 2 Mass spectrum of a lipid sample. The zoomed area displays a small section of that spectrum and illustrates the high mass accuracy that allows clear distinction between lipid species. Lipidomics approaches may be “targeted” or “untargeted”: in the targeted variant, a pre-defined set of lipid molecular species defined by the specific m/z values is “targeted” for detection and quantitation, leaving out lipid species not relevant to the study and suppressing undesired background noise. The “untargeted” variant aims at detecting the entire mass spectrum and thereby enables detection of unknown lipid species. Apparently, both approaches have advantages and disadvantages, with respect to analysis time and sensitivity (Fig. 2). 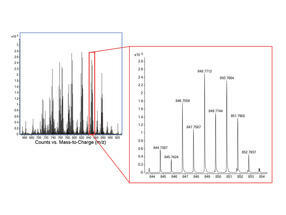 High sample throughput is achieved in a “shotgun” approach in which lipid extracts are injected into the MS without prior chromatographic separation. 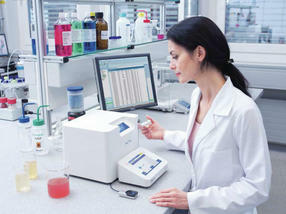 The analysis time per sample takes only a few seconds, to cover either a targeted or untargeted set of lipid species. Although quite fast, this method may be overwhelmed by the large number and highly variable abundance of lipid molecular species. Ion suppression effects (hampering quantification of lipid species) may be reduced or identification of lipids improved by subjecting the sample to chromatographic separation prior to MS analysis; although being perhaps more “quantitative” than the shotgun approach, this variant adds quite significant analysis time. Thus, the preferred methods, which typically complement each other, depend on the specific application. Mass-spectrometric analysis of the lipidome has become an essential analytical tool in basic research, to understand the biosynthetic pathways and their regulation that ultimately define the composition and function of lipids within a cell or organism. Steady-state analysis of a lipid profile under defined environmental conditions, in response to nutritional supply or as a consequence of mutations or pharmacological intervention, is the first line of characterization of the qualitative and quantitative lipid repertoire of a cell or tissue. Dependent on the technical facility and detail of analysis required, this can be accomplished in an automated high-throughput “shotgun” setup for large numbers of samples. A steady-state analysis, however, does not address the dynamics of lipid metabolism, which requires more sophisticated approaches, such as the use of heavy isotope-labeled substrates (e.g. 13C-glucose, 13C-fatty acids or other lipid precursors) and time-dependent analysis of their metabolic conversion: the characteristic mass-offset by the introduction of a 13C-isotope versus the predominant 12C-isotope allows to monitor – over time – the metabolic conversion of the substrate and provides insight into precursor-intermediate-product relationship. Such analyses, however, are rather restricted to basic research and not readily applicable to high-throughput strategies. A rapidly developing area of research in the clinical setting is the recognition of lipids as potential biomarkers: lipidomics approaches emerge as highly valuable tools to identify characteristic – disease-related – alterations in a patient’s lipid profile, e.g. in the blood or other body fluids. The simultaneous quantitative detection of thousands of lipid molecular species in a sample may thus provide the basis for early diagnosis of ailments that may not even be directly related to lipid metabolism but trigger defining alterations of the lipidome. Since lipid profiles are strongly influenced by the ethnicity, cultural background, eating habits, age and multiple other factors, this search for lipid biomarkers as a reliable diagnostic tool compares to the search for a needle in a haystack. The ultimate requirement for absolute quantification to make data comparable worldwide and across different technical platforms is thus still a major challenge . In addition, data handling and data interpretation are major issues of discussion and areas of rapid development in lipidomics research [1,7]. It should also be noted that lipidomics not only describes the analytical detection and quantification of lipids by mass spectrometry: it rather comprises an integrated approach to identify genes and proteins involved in all aspects of lipid metabolism, as well as their regulation and interaction, using a wide spectrum of analytical tools and techniques . Why is there this enormous heterogeneity and complexity of lipid molecular species in the cell and are there specific functions associated with that diversity? Lipidomics will eventually provide some answers to these fundamental questions. Life ultimately depends on the function of a lipid layer about 5 nm thick (= 5 billionth of a meter and 100 times thinner than the skin of a soap bubble) that defines a cell and separates its interior from the external tissue. We better have a closer look and take good care of our lipids!